At the risk of upsetting several political applecarts, I confess Gibraltar has become my favourite entry point to the Costa del Sol. Its blissfully uncrowded and efficient airport stands in stark contrast to its booming cousin at Malaga and it’s a short walk across the road into Spain and the rental car pick-up offices at La Linea. Usually that’s all I see of the Rock and its surroundings, but this time, with a couple of days to spare on my way back to the UK, I decided to take a closer look. It was fun. The poster also bears a rendering of the Arms of Gibraltar granted to the city in 1502 by Ferdinand and Isabella and the words Montis Insignia Calpe, meaning "Badge of the Rock of Gibraltar". The same words appear on the colours of the Suffolk Regiment, which obtained permission in recognition of the part its soldiers played in the Great Siege of Gibraltar. The siege began in 1779. It is clearly not forgotten. Such memories of great moments of the past allied with a palpable sense of Britishness, the latter including a branch of Marks and Spencer halfway along Main Street, give Gibraltar its special flavour. The difference is the climate. Think of the Isle of Wight in a heatwave and you’re getting close, but the geography, dominated by the Rock itself, sets it apart. 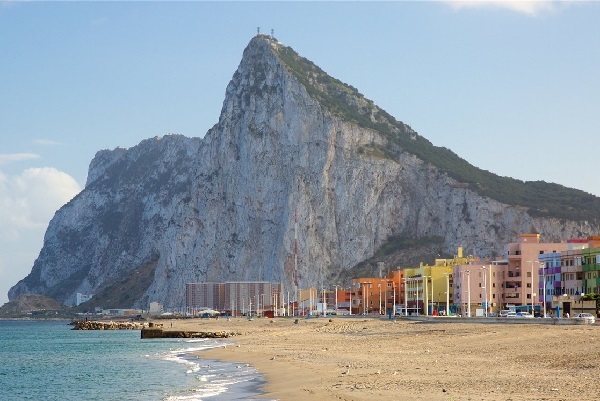 At 426m (1,398 ft), Gibraltar’s mighty limestone trademark overshadows everything and remains most visitors’ No 1 attraction. The peak can be reached via a 6min cable car ride costing currently £13:50 a head, or you can join a minibus or taxi guided tour. These are not hard to find, with visitors assailed at various strategic points in the city by the drivers with “special offers”. The rides to the top come with the advantage of a live commentary but haggling skills and a thick skin can be useful in negotiating the fare. However you arrive, the view across the whole of what is still called a British Overseas Territory is worth the effort. The so-called Barbary apes, which are actually macaques originally from Morocco and have been here since at least 1605, are much in evidence. The official count is 300 but there seem to be more and they can be aggressive. I saw one visitor lose a pair of sunglasses and case and the animals think nothing of clambering on and over any passing vehicle looking for trinkets to grab. 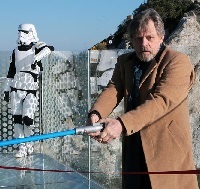 The top of the Rock has a variety of attractions, the most recent the glass-floored Skywalk opened earlier this year appropriately by the actor Mark Hamill, who played Luke Skywalker in Star Wars. It allows those brave enough to stand over a precipice apparently with nothing beneath their feet and was already scary enough but is presently partly closed after a crack appeared in one of the panels, possibly through vandalism. The part that’s still open was quite enough for me. In the same vein, and if you are able to make sense of the lunatic signage at the peak, there is a thrill-seekers’ trail around the area, one of three for the sort of intrepid explorers the Rock attracts. Other draws include a nature reserve and, for historians, the tunnels bored into the rock by engineers during the Great Siege and later extended during World War II. It is easy to spend several hours exploring. After your exertions, the new Mons Calpe Suite offers food, cocktails and a brilliant view or there is a tourist-style café if you’re in a hurry. 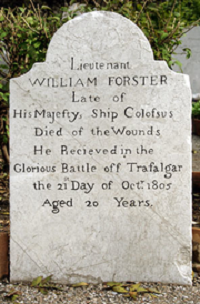 Back at ground level, the Trafalgar Cemetery is one of many reminders of Nelson and his best-known victory and, opposite, a “talking statue” of the man himself to explain things. Nearby, the Gibraltar Botanic Gardens, known as La Alameda, provides an oasis of calm after the excitement of exploring and contains a wildlife conservation park with rescued animals, some injured by shipping in the busy straits. Meanwhile, the modern face of Gibraltar takes shape west of Main Street, with the Queensway Quay area up from the equally busy cruise terminal leading the way. The Waterport Place commercial development is one example; others include The Atlantic and Atlantic Suites and the Quay 39 waterfront residences. 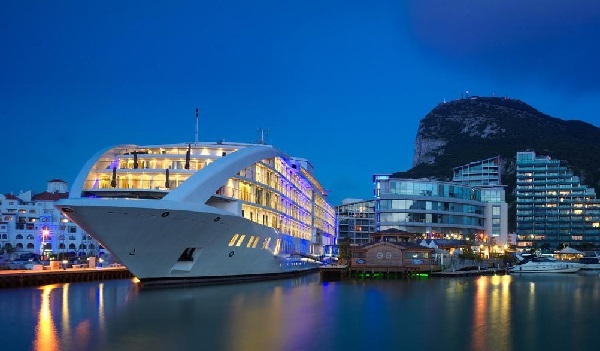 There’s more at Ocean Village, including Sunborn Gibraltar, billed as the world's first 5-star super-yacht hotel (see BTN 10 August 2015), while a newly-opened Holiday Inn Express in the North District has also added to Gibraltar’s room count. As for the airport, work is finally under way on a four-lane tunnel under the single runway. This is the famous runway that runs across the main road into town and therefore stops traffic and pedestrians every time an aircraft lands or takes off. Completion of the tunnel is scheduled for the first half of next year. It will be an undoubted asset, but I still like the airport even without it. EasyJet has announced a new Luton – Gibraltar service from 4 December, re-establishing a link lost after Monarch ceased operations. The airport now joins Bristol, Gatwick and Manchester on easyJet’s Gibraltar route schedules. British Airways is increasing frequency between Heathrow and Gibraltar from 28 October from the existing nine a week in the winter period to 13, an increase of 44% in seat capacity, or 1,344 extra seats weekly. BA also has a six-a-week service from LGW and flights from Manchester.